New 24-Hour Precipitation Record for New York State! Extreme rainfall (shades of orange, red, purple, and white on the map) shattered records in several areas. Heavy rain has brought flooding to the Northeast and a preliminary New York State 24-hour precipitation record! Islip LI MacArthur Airport received 13.57" between 9:10 PM EDT August 12th and 7:54 PM EDT August 13th. This breaks the previous record of 11.6" at Tannersville, NY on August 27-28, 2011 during Hurricane/Tropical Storm Irene. See the National Weather Service statement. Other rainfall totals include 6.3" in Baltimore, MD, 8.93" at the Millville Airport, NJ, and 5.57" in Atlantic City, NJ. This qualifies as a 24-hour 200-year storm event for Islip, meaning rainfall of this magnitude is only expected to occur once in a 200-year period. 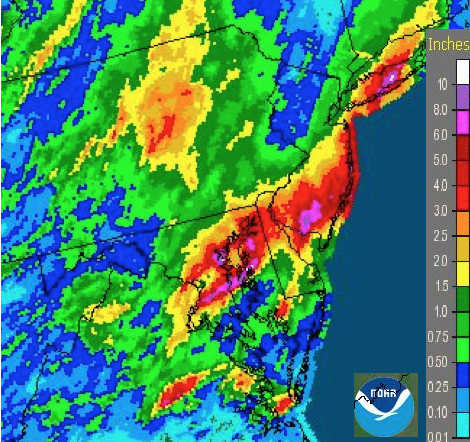 Pictured above is the 24-hour rainfall ending at 8AM from the Mid-Atlantic RFC, which combines radar data, rain gauge data, and satellite data.